The Collective was one of the primary donors central to funding Andrew Gillum’s recent meteoric rise in the Tallahassee mayor’s successful primary fight for Florida’s Democratic gubernatorial nomination. It reportedly injected nearly $2 million into Gillum’s campaign, funding television and radio ads, get-out-the-vote drives, and playing a key role in helping Gillum defeat his Democratic opponents, some of whom were better-funded and had more statewide name recognition. The group announced plans to continue backing Gillum during the current general election campaign. A closer look at The Collective’s individual donor list for the 2017-2018 cycle finds that Soros provided $70,000 in December 2017. Planned Parenthood, also financed by Soros, is listed as providing $12,500. The clear majority of The Collective’s large donations came from a single entity, Collective Future, which is the 501c4 arm of The Collective and as such does not need to legally disclose the sources of its own funding. FEC records show that between May and July, during the heat of Gillum’s primary race, Collective Future pumped a total of $1,624,772 into The Collective. The Collective’s co-founder, Quentin James, declined to comment to a Breitbart News request seeking clarification on Collective Future’s donor list. James was asked by email to comment on “the source(s) of the funding to Collective Future.” He was also asked whether Soros or billionaire Tom Steyer, both of whom separately backed groups promoting Gillum, were donors to Collective Future, particularly considering Soros’s direct $70,000 donation to The Collective group. “We’re gonna decline here but thank you for reaching out,” James replied. James himself has previously worked for Soros-funded organizations. He formerly served as the National Director for the student coalition of the Soros-funded Sierra Club. He also served as a National Board Member for the NAACP, which is heavily financed by Soros. James co-founded Vestige Strategies, a consulting firm that he runs with his wife, Stefanie Brown James, who held national roles in campaigns for both Hilary Clinton and Barack Obama. Brown James is also The Collective’s co-founder and senior adviser. Vestige Strategies’ website boasts “experience” and “recognitions,” including work for the Soros-financed groups NAACP and the Sierra Club. Other listed groups include the super PAC Ready for Hillary, as well as Obama’s 2008 and 2012 campaigns. The refusal of Collective Future to disclose its donors is instructive given Gillum’s warning in February about the influence of “dark money” in the race, referring to entities that obscure their donors. During the primary, The Collective’s efforts focused on opposing Gillum’s main opponent, Gwen Graham, including attempting to brand her as a fake liberal. Now the group is expected to turn its efforts against Ron DeSantis, the Republican nominee. Speaking recently to the Tampa Bay Times, James confirmed that Gillum could expect “far” more support from his Collective group. “We have plans to far exceed that amount before the primary and the general election,” he wrote in an email to the newspaper. Asked why his group singled out Gillum, James noted the centrality of Florida to national politics, including the possibility of putting the Democrats in charge of the Senate and House. Florida presents unique opportunities in 2018, including the possibility of electing the state’s first African American governor and attorney general, flipping some congressional seats including in Florida 18 and 27, re-electing Senator Nelson to the United States Senate and returning voting rights to to its citizens who have served their time. The Collective’s support for Gillum came alongside donations to aid the politician by other progressive groups, including one run by Steyer, who spent $1.4 million on Gillum’s race. 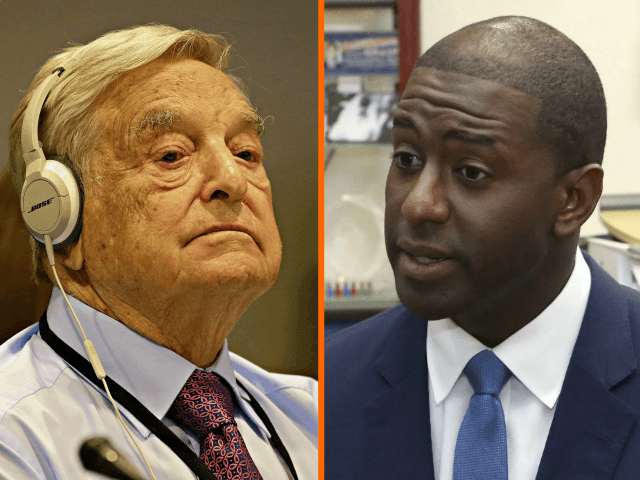 Days before the Aug. 28 primary, Soros joined with Steyer to lead a group of donors making a $650,000 infusion into Gillum’s coffers. The Collective runs a “Black Campaign School” where James says they train people on how to build a political movement in America’s “heightened, almost racist environment.” He charged that this environment has spiraled into “white supremacy” under the tenure of President Trump.